The purpose of this study is to demonstrate the use of wavelet transform (WT) as the common processing tool for earthquake’s rapid magnitude determination and epicentral estimation. The goal is to use the same set of wavelet coefficients that characterize the seismogram (and especially its P-wave portion) to use one technique (WT) for double use (magnitude and location estimation). 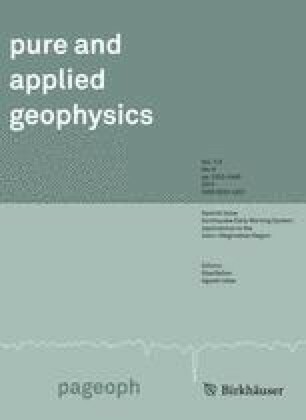 Wavelet magnitude estimation (WME) is used to derive a scaling relation between earthquake’s magnitude and wavelet coefficients for South Aegean using data from 469 events with magnitudes from 3.8 to 6.9. The performance of the proposed relation was evaluated using data from 40 additional events with magnitude from 3.8 to 6.2. In addition, the epicentral estimation is achieved by a new proposed method (wavelet epicentral estimation—WEpE) which is based on the combination of wavelet azimuth estimation and two stations’ sub array method. Following the performance investigation of WEpE method, we present results and simulations with real data from characteristic events that occurred in South Aegean. Both methods can be run in parallel, providing in this way a suitable core of a regional earthquake early warning system in South Aegean. This research has been co-financed by the European Union (European Social Fund–ESF) and Greek national funds through the Operational Program ‘‘Education and Lifelong Learning’’ of the National Strategic Reference Framework (NSRF)–Research Funding Program: ARCHIMEDES III. Investing in knowledge society through the European Social Fund. Project “Interdisciplinary Multi-Scale Research of Earthquake Physics and Seismotectonics at the Front of the Hellenic Arc (IMPACT-ARC) “TEI of Crete” (MIS380353).